Proper hose repair and maintenance are essential to consistent production output, efficient long-term fluid management and a safe and compliant work environment. 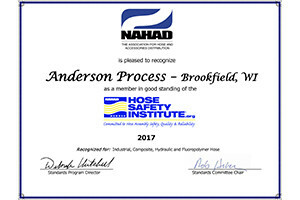 All Anderson Process hose assemblies are manufactured, tested and certified to NAHAD specifications to ensure quality performance over the life of the hose. 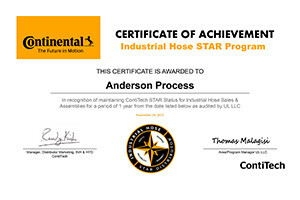 To help prevent untimely and costly hose failures, Anderson Process offers RFID hose tracking services that encourage best practices in preventative maintenance by providing customers visibility of ideal service intervals. Our hose services help keep your equipment NAHAD compliant. RFID technology provides real-time tracking visibility over your hose equipment. Preventative hose maintenance promotes facility safety.